An Asus slide has revealed the Asus Transformer Prime release date, which the company has set as 9 November. Poor old Asus – only its investors were meant to see the slide, which also speaks of its Windows 8 tablet plans and the launch of two new Android slates in the first quarter of 2012. It's good news for us though, as we'll be seeing the slinky-looking Asus Transformer Prime hit the shelves in just over a week, with plenty of shopping time left before Christmas. Of course, there's no confirmation that 9 November is the Transformer Prime UK release date, but we'd hope it's a global launch, or that a UK release isn't far behind. Asus hasn't technically launched the Transformer Prime officially, but its CEO, Jonney Shih, showed it off on stage at AsiaD in late October. He bragged that the slate will come with a quad-core Nvidia Tegra 3 processor (aka Kal-el), a 10-inch screen, a battery life of 14.5 hours and a waist-size of just 8.3mm. Unfortunately, it looks set to land with Android 3.0 Honeycomb, but should receive the Ice Cream Sandwich update before the year is out, according to Shih. 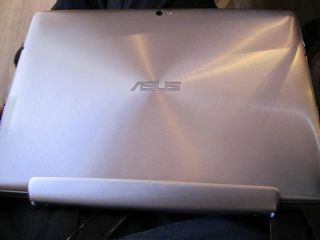 Close-up pictures of the Transformer Prime have since leaked, too, showing a design aesthetic similar to that of Asus' gorgeous, slender Zenbook notebooks.